The Toyota RAV4 is a versatile crossover SUV that offers a hybrid powertrain. Despite its low price tag, this compact model boasts some impressive interior amenities that are anything but standard. 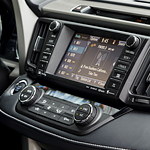 The Entune Multimedia System in the RAV4 links you to a virtual world of applications. From GPS navigation to music streaming, you have access to dozens of digital utilities. Siri Eyes Free is ready to assist you while you're behind the wheel of this crossover SUV. The JBL GreenEdge audio system includes 11 speakers that emit concert-like acoustics. SiriusXM Satellite Radio, iHeartRadio and AM/FM radio deliver awesome content in this family-friendly vehicle. USB 2.0 ports and Bluetooth could be used to import other multimedia. Having a prime location, Toyota Of Plano encourages you to check out the Toyota RAV4. This affordable crossover SUV is available in several hybrid trims that deliver class-leading efficiency and interior features.